Anyone who remembers those old Hammer Horror films (or indeed still watches them) will just adore this book, along with anyone else who loves a good story. In their hey-day between the 50's and 70's the Hammer films starred such great screen actors such as Peter Cushing and Christopher Lee with films like The Curse of Frankenstein (along with 6 sequels), Dracula (with 8 sequels) and The Mummy - along with countless others. These films were firmly rooted within the gothic style and completely dominated the horror film market for a number of years, so much so that the name Hammer to many people means a style of film rather than just the company who made them. Imagine then that at the height of the Hammer popularity there was a grand epic produced that crossed the Dracula and Frankenstein films with Dr Terror's House Of Horrors and you can begin to grasp the idea behind Hell Train. Picture a steam train (known as Arkangel) travelling through Eastern Europe during the first World War. As it races through the war-torn lands four of it's passengers must solve the bizarre mysteries on board if they are to survive the journey. What is the tragic secret of the veiled Red Countess who travels with them? Why is their fellow passenger the army brigadier so feared by his own men? And what exactly is the devilish secret of the Arkangel itself? This story, being penned by an American screenwriter who is visiting the UK during Hammers hey-day in the 1960's, is the main body of the novel. It's an interesting idea to write a story within a story, not only does it make any well-established stereotypes found in the average Hammer film easier to bare (after all it's a script for a Hammer film) but it also adds a whole other layer to the book. There are the occasional returns to "reality" - which are quite unexpected when they happen - but for the most part the book is deeply embedded within this Hammer script. It's an incredible feeling to read a novel that is so enamoured with this famous film company, the atmosphere is perfect and it really does feel like you are reliving one of those classic films in the 60's - complete with a vividness that marks the talent of the author. 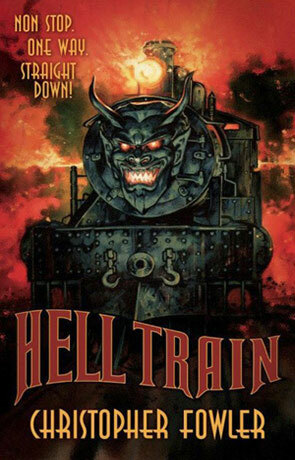 Immersive doesn't even begin to cover it in the slightest and it's almost impossible to believe that Hell Train wasn't a real hammer film. The story unfolds just as you would expect a film of it's type to play out and this includes characters being despatched in a dramatic fashion and some new scene of Horror on nearly every page (once the story gets going). The characters are brilliantly penned, each with their own little foibles and eccentricities and each seems to have their own little secret - a reason for being on the "hell train" that even they may not be aware of. You don't have to be a fan of Hammer Horror or even Horror in general to like this book, there is just so much going for it and the charm, elequence and inventiveness should appeal to most adult readers. Written on 15th February 2012 by Ant.